Ready to jump into the Rabbit Hole? 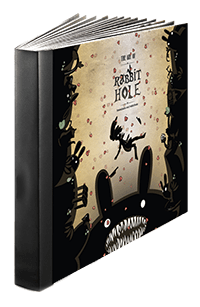 Put in your email to follow the rabbit and get an exclusive 26 pages Rabbit Hole digital artbook. I'm not ready to follow the black rabbit. Get me out of here! Jumping into the Rabbit Hole? This one is a tribute to all my JRPG summon spells, especially Final Fantasy. Ever wonder what happens to your loot after you sold them to NPC? Me too. Rabbit Hole is an upcoming story-driven - RPG filled with cosmic horrors and mental illness, then wrapped in the wackiness of Alice in Wonderland. Would you like to follow the rabbit?